CALLAHEAD is renowned for evolving the portable sanitation industry by consistently developing our equipment to offer our clients the most up-to-date products. Our FULL SERVICE HEAD exceeds the demands and expectations of today’s portable toilets, and is our newest addition to our long list of equipment options. 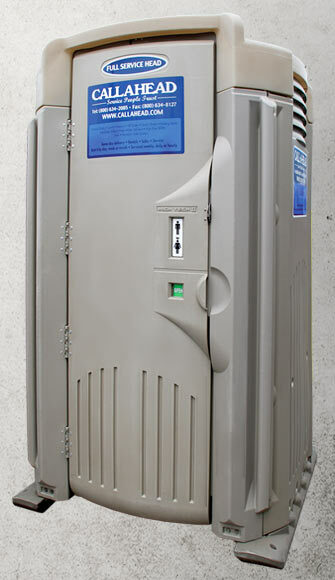 An upgrade from CALLAHEAD's Construction Wash and Flush, the FULL SERVICE HEAD is the largest polyethylene portable restroom available today. This unit is a work of art, with its distinctive art deco design that is sure to set your job site or special event out above the rest. The flushable stainless steel bowl is designed for easy cleaning and eliminating odors, operates by a foot activated pump for touchless flushing. The FULL SERVICE HEAD also has the toughest made mounting and plumbing system available on the market. Outfitted with a large 90 gallon holding tank, this unit is built to handle high volume usage, and perfect for those heavy traffic job sites and events. The FULL SERVICE HEAD will enhance every user's experience with amenities that feel closer to home. 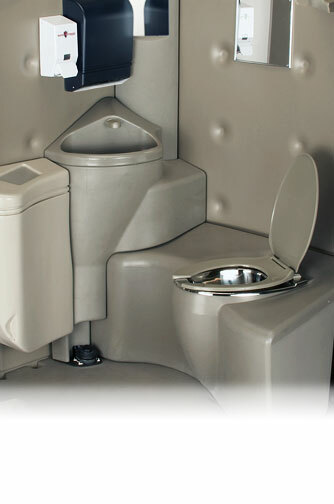 With an extra large interior, users will appreciate a greater range of motion while using this portable restroom facility. The FULL SERVICE HEAD has a custom fitted sink with a foot activated pump, and separate water reservoir to ensure there is never contamination from grey water. Equipped with both soap and paper towel dispensers, refilled and maintained by CALLAHEAD, the user is assured of sanitary handwashing capability. A conveniently placed, custom designed wall mounted waste basket will keep paper towels and other trash out of the toilette as well as off the floor, keeping your restroom cleaner and unclogged. A modern venting system creates a chimney effect, pulling air through the unit's floor vents, and the hot air is released through the ceiling vents, for a virtually odor free unit. Additional amenities include a four roll toilet paper dispenser, convenience shelf, solar powered lighting, and a high quality mirror, making the FULL SERVICE HEAD the total package in portable restrooms. For comfort, convenience, and complete sanitation when using a portable toilet, the FULL SERVICE HEAD is the ideal choice for your job site or special event. CALLAHEAD thrives on providing our clients with nothing less than quality equipment and superior service, which is why we are the greatest portable sanitation company in the country. We exceed all others in our field, as we have for nearly four decades. Never settle for less when it comes to restroom comfort and quality service, CALLAHEAD! Material: Polyethylene • Color: Medium tan • Tank: 90 gallons • Ventilation: Floor vents and ceiling vents • Height: 91" • Base width: 52.5" • Cabana width: 51.5" • Base depth: 48" • Cabana depth: 47" • Inside height: 81" • Inside width: 49" • Inside depth: 44" • Door opening height: 75" • Door opening width: 26" • Head room (seat to wall): 20" • Floor area: 1036 sq. in. • Weight: 299 lbs. • Average number of use before service: 150 • Recommended 12-15 people on an average 40 hour work week. Twin-sheet polyethylene thermo-formed construction. • Reinforced, highly durable flush mounting system with no exposed plumbing. • Commercial grade polished stainless steel bowl keeps bowl cleaner and eliminates odors. • Foot activated pump provides a touchless experience when flushing. 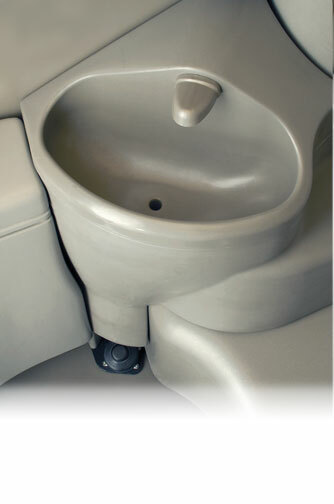 • Foot operated sink with separate water tank for sanitary handwashing. • Paper towel dispenser. • Custom designed waste basket. • Four roll toilet paper dispenser. • Convenient solar powered light. • Convenience shelf. • High quality mirror. • UV resistant roof. • Completely ventilated using the chimney effect. • Enclosed dual aircraft cable and spring door. • Occupancy sign. • Check list posted inside and signed at each service call. • Extremely spacious interior. • Distinctive art deco design. • Top and bottom handles for easy maneuverability. The Full Service HEAD Flushing Portable Toilet and Sink.